Model's Model by Mia Alexander - 6.500" x 10.000"
Model's Model framed print by Mia Alexander. Bring your print to life with hundreds of different frame and mat combinations. Our framed prints are assembled, packaged, and shipped by our expert framing staff and delivered "ready to hang" with pre-attached hanging wire, mounting hooks, and nails. Thank you Detlef. That is the part of shooting models that I really enjoy, i.e conceptualizing the shot, then having the model execute it in the way I visualized, and this is an example of that coming together in this shot. I love your "Stairway To Nowhere", it's excellent. 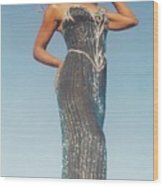 Top model at home on the set in a Bob Mackie vintage designer gown.